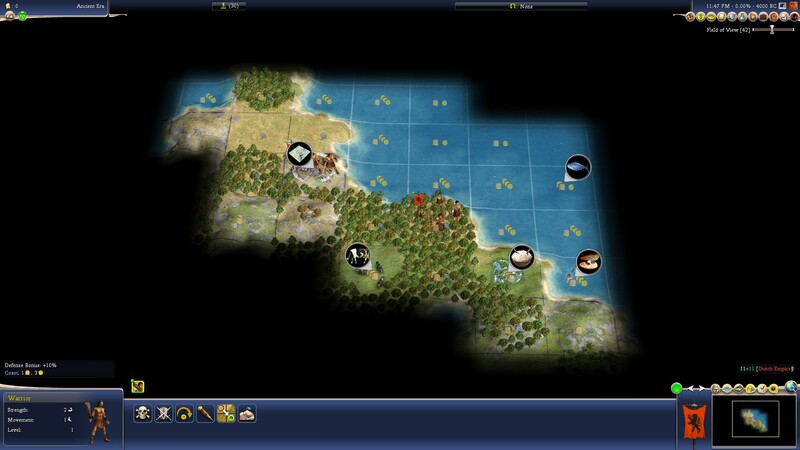 Discussion in 'Civ4 - Strategy & Tips' started by Fish Man, Nov 10, 2018. The Nobles' Club series started out as a way for Noble-level (and below) players to improve their game. Most of the original participants now play at much higher levels, so this has become a way for advanced players to help others learn to play better. You can play your own game at any level and with any mod, but it would be nice to comment on the games of other players and give them advice. Our next leader is Willem of the Dutch, who we last played in NC CXXIII (can someone please translate that to normal numerals for me...). The Dutch start with fishing and agriculture, the 2 main food techs of the game. Willem is creative and financial, and for that reason he is considered a top-tier leader. I personally find him to be #3, right after the Quechuamaster and Lizzy - financial gives a significant economic advantage throughout the game while creative virtually ensures winning border wars, quickens the 2nd most important building, and allows for much more flexible city placement while allowing you to reach some resources up to 50 turns earlier. The UU, the East Indiaman, is a galleon that is 6 strength instead of 4 and carries 4 units instead of 3. The extra capacity basically saves you 33% hammers in building an invasion fleet while the strength means that these ships get more than 10x better odds vs frigates. Powerful stuff indeed. The UB, the dike, gives +1 production to water tiles as well as riverside tiles and can be built in any coastal city as well as any riverside one. It's a significant bonus, but at a stage of the game where it might matter less. Still more useful than a lot of other things, though. Fractal, low sea level, arid climate. No other edits. Are you sure you wanna know? Willy's got himself in a bind this time! Surrounded by nothing but jungle and useless desert, can he outsmart his hand-picked ultra-OP opponents and whip his way to victory? Since this is NC 200, win in under 200 turns on noble!!! If you play above noble, add 10 to that number for every difficulty level increase (210 prince, 220 monarch, 230 emperor, 240 immortal, 250 deity). Finally, a cut and paste of our standard doctrine:The WB-saves are attached (zipped; they are bigger than standard saves). To play, simply download and unzip it into your BTS/Saves/WorldBuilder folder. Start the game, and load your favorite MOD (if you use one, if not, check out the BUG MOD), select "Play Scenario", and look for "NC number Leader Noble" (or Monarch, etc., for higher levels). You can play with your favorite MOD at the Level and Speed of your choice. From Quick-Warlord to Marathon-Deity, all are welcome! We stuck with the name "Nobles Club" because it has a cool ring to it. In each scenario file you can select your level of difficulty, but that doesn't give the AI the right bonus techs by itself. Use the Noble save for all levels at and below Prince. The Monarch save gives all the AI Archery. Emperor adds Hunting; Immortal adds Agriculture; Deity adds The Wheel. For players on Monarch or above, you should add archery as a tech for the barbarians (if you don't, the AI will capture their cities very early). This cannot be done in the WB save file and must be done in Worldbuilder as follows. Zoom in all the way so you can't see the rest of the map. Use the CTRL-W key (or the menu) to enter the worldbuilder. Avoid looking at the mini-map in the lower right corner. By default you're in "player" mode (look in the box in the upper right; the icon that looks like a person should be selected). You'll get a drop down menu labeled with your leader's name. Barbarians are at the bottom, so cover the rest of the list with your hand if you don't want to see who else is on the map. Select "Barbarians". Select the "Technologies" tab in the box on the left. Find Archery (the arrow head icon; 8th row, 3rd column from the right) and click it. Zoom out again after the map fades, and start playing. If you're playing at higher level than Monarch, consider also giving them Hunting at Emperor, Agriculture at Immortal, and The Wheel at Deity. The standard saves have no huts and have events turned off. If you want tribal villages and random events, choose the saves with "Huts" in their names. If you want huts but no events, select the Huts saves and use Custom Scenario to turn on the option that suppresses events. And with that - let the games begin! elementoffear, Olafeson, Imploding and 3 others like this. Holy moly! A new NC already? My body is ready! The starting warrior is in a most unhelpful location to scout our starting position. Looks like a green hill 2S, can't say without opening the save and fog gazing. Settle on the rice FTW! Fish Man and krikav like this. Thanks for putting up a map! And in time for the weekend and everything. Would want to climb that marble for a 3 -city. But that would walk away from all food, and in all likelyhood orhpan the fish. C = 100, X=10, I=1. So it's 100+10+10+1+1+1. I have started to translate all roman numerals to regular numbers. You're welcome, I hope you enjoy - and thanks for the numbering tip! I think...Pacal had one of his settlers zergrushed by barb archers . Guess two of them were enough to overcome a holkan. Meanwhile, Colossus has been built in a faraway land. WHAT THE F@#$. It's bad enough that Oracle went, oh idk, 2240 BC? We've already got one or more wondermongers and potential runaways here. Downloaded, will start sometime this weekend or at least head of the week I think. Thanks @Undefeatable, quite the turnaround time there! krikav and Fish Man like this. Settling choice is tough. At first glance, I'm really, really tempted to settle on the rice. Not only does it lead to a faster start, but it also frees up the Marble PH for a second city. OTOH irrigated rice is a great tile, and SIP is really good for sharing food. I moved warrior NW, and then settler SE onto the rice. I can settle a second city on the marble which can enable a oracle gamble. That city can also help develop two cottages for the capital, which will have no problems with plains cottages with all that food. Already thinking about moai when I see 3 seafood, a lake and loads of coast. Another city to the right to borrow the clams and the fish in the NW has at least one possible city spot if I settle on marble. Not even renaming him to Bearkiller did the trick. At t26, I have found pacal and we are likely alone. I have also seen no happines resources that I can use. So an early monarchy will come into play since it's his fav civic. With the marble available, I'm shooting for a oracle gamble, myst+med+priest isn't wasted in any case since I do need to get there sooner rather than later. Borderpop at t26 shows me that there is some islands out there, so it could have been a better idea to go for GLH. But now I'll continue on the oracle path. Have to chop warriors. Damn you bearkillerkillerbear! Nice timing, settler ready to settle next turn, as are the worker ready to chop, and masonry is in. Marblepowered oracle! A complication... An chop that was for the oracle goes into a warrior. Which did survive! Overflow from settler whip goes into oracle in capital, because I'm greedy and also want some failgold! I did work some coast, and prioritized keeping citizens alive to work the lake and such, to speed up research. I did manage to get to pottery and grabbed MC from the oracle. Getting monarchy would have been perfecly ok as well. But pacal just revolted to orgRel and is likely on the way to monarchy which I hope to trade for. We seem to be on a gigantic continent with ample of room. Not sure how to handle this yet... Want to wait abit longer and see if I can get hinduism. Do I want to beeline optics, or do I want to expand like a mad dog on this continent? Some inbetween alternative with CS before optics? Going for aestethics and the marble wonders is also an option. Been so long since I played a game with early marble! Think some more once writing is in. Nice writeup, though I disagree with your choice of city placement. Though there's plenty of food to go around, on deity where maintenance is crippling, I'd like to have at least 2-3 "good" workable resource tiles in the BFC. Oh and BTW, I'm updating the challenge. Also what difficulty are you playing on? My hope is to make this more possible to complete on higher difficulties. AH - Mysticism - Masonry - The wheel - Poly - PH - Mining - BW - Pottery. Pretty poor choice tbh, should have went for the wheel after AH and get a earlier War Chariot with the horses. Did not really plan ahead. Wanted to go to 3 cities and build the Oracle and the Temple of Artemis. But i forgot how impossible it is to shoot for the oracle on Deity. The turn i got PH the oracle already went (1920 B.C.). Not even failgold . Well at least i got the temple of artemis in Minas Anor. did build it there because of the hammers which the cow, horse and the marble provided. Also the PH with forests. So did not even need to chop to secure it. But at least the war chariot was just in time to fight off the barbs who entered my borders. No improvements got pillaged. Guess if i wanted the oracle i should have settled on the rice, went for settler at size 3 or 4 and settled straight on the marble and build it with the horses and the cow from Capital, maybe also with the PH forest tile. Going straight for AH - Mysticism - Masonry - Meditation - PH. But on deity it seems to me always kind of a gamble to shoot for the oracle, if you go for it and fail (like me in this game) you invested a lot in rather useless techs early and cripple you expansion and tile improvement. Probably only going for the oracle if i can settle my capital or 2nd city on the marble in the future and never going to try it again building a quarry and a road. it is just so unreliable and then what you even oracle? Monarchy? HR? Meh ..... Often times you need to delay your oracle finish till you got at least writing or pottery and BW so you can go for MC or CoL. Which makes it even more likely to been build by an A.I. Well it will not kill me with such good land. Will probably rex now from 3 cities to 6 or 7and go Writing - Monarchy - Aesthetic - Literature. Grab the Great Library and then go for either Music or Optics and Astro. Since it looks to me i am Semi-Isolated with Pacal. After getting some sleep, and looking at the game again. I realized that since we are on a large continent, and it's allready turn 54. I reeeeally need some defense, and with no copper, and no AH yet I really should be going for archery. 3 turns later a barb archer is on the way. A brave hero on a hill will stand his ground though! My WB finally rounds the southern tip, and finds Lakamha, the doubbely holey city of the frozen south! GLH went last turn. Glad I didn't even try to grab it as well. Thats a killer capital for a financial AI. Fur, 3 seafood with 3commerce. Loads of floodplains. In some ways thats very nice. "My" continent will not be entierly backwards, and I'll probably have some nice trading opportunities. And if I decide to go for Pacal later on, that city will be lovely with loads of mature towns. T64, AH is in and I find out I have horses. That puts cuirs on the table I think. I'm already on the path for astro with the oracled MC, but the land is great and perhaps it would be better to just develop here and later gain dominance over the entire continent with cuirs, and later find a soft target to attack with cuirs upgraded to cavallery? The two future river cities will take some time to develop, but will be very good later on. The yellow one will also be able to help develop cottages. The red one is just to grab stone, which I want for moai. Creative makes it possible to settle with fish the outer ring. There is also at least two sites with gold, to the east there is at least a clam, but it's really far away. The southern gold has no food and is so close to pacal so it's not worth to bother. I also have a decent backfill city in the north, that can get improved fish and cow right from the start. This city will be fastest to get up and running and is likely the next to settle. However if Pacal starts to pick up the pace, I'll have to reconsider. Mansa was in the game (30000 soldiers @ demographics start) and is likely to be the founder of Buddhism. 27% influence tells me that he has managed to spread that quite alot. Two of Pacals cities has Hindu, and thats 9%. So 27% I guess means that it's at least two, probably even 3 AIs that has some Buddhism going on. That Confucianism is already at 13% tells me that it's some other AI that cares about religion that got deprived of his/her chances when pacal took both hindu+juda. Beelined Confu and started to spread quickly. Thats great news, because it means that the AIs won't be involved in a total lovefest with mansa musa keeping techrate and trading at full tilt. I'm playing at deity, although I'm not that good. (Have only landed 3-4 deity wins). A pre-T200 win is totally out of the question for me. I'm loving the map so far though. A sigh of relief that there is religious controversy abroad. Oracle MC was probably a bad idea. I'm now 10 turns later and I have not traded it, (no Alfa). I don't have sailing so no boats. And I haven't put a single hammer into a forge yet. So I have gotten 0 utility from MC so far. Not at all sure how this will play out. Hopefully Pacal goes for alfa soon so I can get some benefit from MC. (He did get writing ages ago). Regarding T250, I'll see what I can do. I'm thinking that I could get some speed up with Gpersons with the aid of GLib & national epic and/or pacifism. Also I'm quite confident about self-teching quite abit with a fin-leader. SIP wastes fresh water too though, most of the time just translates to 2 food throughout the game if it's the capital. Settle on the rice also gives a 1F bonus the the city throughout the game. So I don't think settling on the rice is that bad compared to SIP. Regarding oracle... I'm in a situation now (T64) where I kind of regret getting MC, having gained no benefit so far, and having invested quite abit in that path. However, with Pacal as a neighbour in semi-isolation, going to monarchy isn't a bad idea. Monarchy usually comes into play in isolation/semi-isolation if there isn't loads of happy resources around. And priesthood opens up the path to CoL much cheaper than currency does. Meditation you need for philosophy later on. And HR is Pacals fav civic. Getting monarchy with oracle isn't that bad either, especially not in isolation situations. That is at least my reasoning for going that route. Woah! Barb spears at your door? I'm sure glad I went for archery! Did SIP, as was playing with barbs after very long time playing without, went "ultra safe" and built GWall (yes, yes, that safe ), followed by GLH (could see that there is some ocean-bridge to atleast one island - instant 2 commerce trade route as soon as capital gets to 1500 culture). 1st GP was GSpy (2nd was GMerchant for MC bulb) so used to scout entire landmass, "defend" two city spots to move in settler without defender. Quickly did realise that my neighbour is teching pretty fast so I might have just one good chance to do something before Longbows - so went for HBR and HArchers. In short - managed to do that stuff just in time as only capital had fresh Longbow at attacking turn. Used excess HArchers to deal with 1 more mainland and 1 barbs city on island to NE (good place for 2 cities to give instant 7 commerce/city (with Currency) to all mainland coastal cities) and made contact with AI there... oh, hello grey Budism guy, nice to meet you, I will go no-religion now (had Confu/Christ mix from neighbour spread) to stay neutral for some time. Now at 30 AD - city on NE island got culture "over" to land to east (important for resource trades, access to trade routes and safety up to Astro), met 2 more AI, traded map (oh, big land and fast AI there ) from one of them, will meet rest of AI in few turns. Oversea trade routes now pumping in big money. 12 cities, some more coming soon, lack of workers but thats the price for HA rush. AI tech pace is really fast (even for NTT) but religion situation might give some good time to do my own stuff before dealing with AI. Want to go for Space here as thats what I want to do on 200th NC and that would make DIkes useful too.